Job search is a process of collecting information that pertains to job vacancies available in the labour market. During the search process, the job seeker collects information on the job offer distribution and learns more successful strategies. In the job search process, job seekers can influence the out come by putting more or less efforts into the job search and by choosing among several search methods. 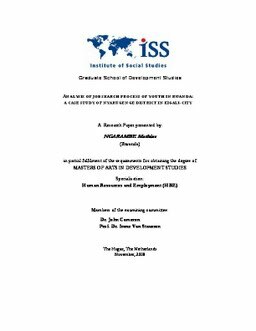 This research seeks to analyse job search process of the youth in Rwanda taking Nyarugenge district in Kigali-city as a case study. The research is purely qualitative. Data was collected from 35 respondents using interview guide and a desk study was applied in collecting secondary information. The research findings indicated that the main job-search method being followed in searching for jobs by the youth in Nyarugenge district is by direct methods/news papers’ advertisements/ media and personal contacts. Furthermore, the findings from the study showed that the ability to be active in searching for jobs depends on the better access to social networks including adults already in employment about job opening. Research results also indicated that many of the obstacles experienced by the youth in the job search process are the result of short comings in the education and training systems, work experience and the local environment especially the state of local markets. To improve youth job search process in Nyarugenge district and Rwanda at large, in the absence of sufficient growth in private or public formal sector employment, there is a need to create a favourable environment which would facilitate economic growth and eventually lead to the promotion of youth selfemployment and entrepreneurship, setting of special youth credit program, change of education and training systems that offer skills that correspond to the needs in the labour market and establishments of employment agencies that would facilitate the youth in searching for jobs.